This year, 2019, marked the beginning of a prosperous year for approximately 120 young people from the Knysna and Plettenberg Bay municipal areas, as they benefited from the Garden Route Municipal Training Programmes, which includes: First Aid Level 3 Training; Driver’s License Training and Law Enforcement Training. These training programmes originated from the Garden Route Rebuild Initiative (GRRI), which was established after devastating fires hit the district (Knysna/Plettenberg Bay) in June 2017, and the need for a District Skills Mecca was identified. 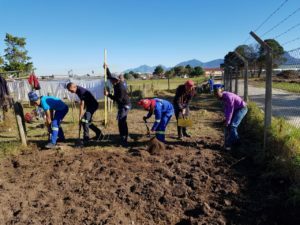 The Training Programmes are funded by the Garden Route District Municipality (GRDM) and is managed through the Office of the Executive Mayor, under the Expanded Public Works Programme (EPWP). The project’s primarily focus is on youth development in the Garden Route, building capacity among young people; breaking the chain of unemployment and ensuring a marketable labour force in the region. The GRDM Executive Mayor, with his delegation, political leaders and officials from the Bitou Municipality, Service Providers and beneficiaries of the Training Programmes. 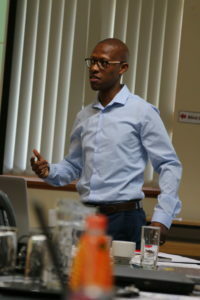 During the official launch of the training programme, which kicked-off in Plettenberg Bay, the Deputy Mayor of the Bitou Municipality, Cllr Sandile Gcabayi, warmly welcomed guests and applauded the District Municipality for the initiative of providing skills development opportunities to young people in the district. 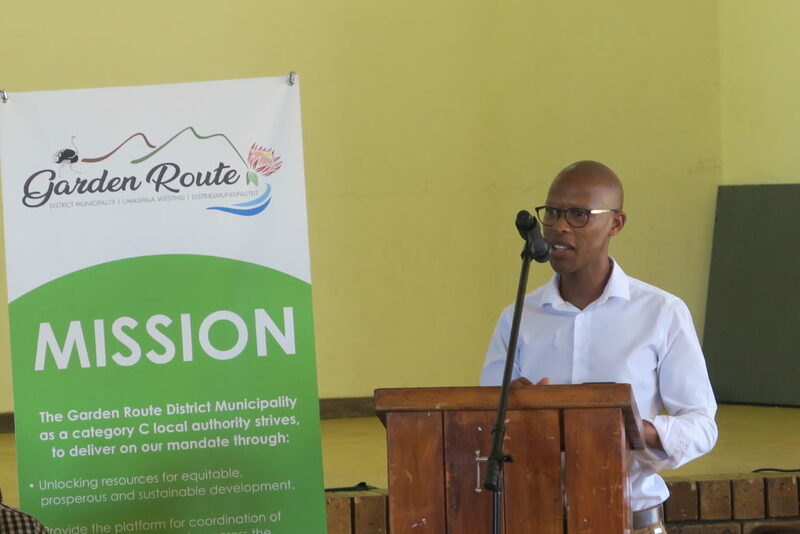 Cllr Sandile Gcabayi, Deputy Mayor of the Bitou Municipality, during the official welcoming at the launch of GRDM Training Programmes in Plettenberg Bay. The Manager in the Office of the Executive Mayor, Mr Siphiwe Dladla, briefly explained the background, purpose and objective of the project. When elaborating on the selection and recruitment process he emphasised that according to the number of applications received, the need to continue with the programme is evident. 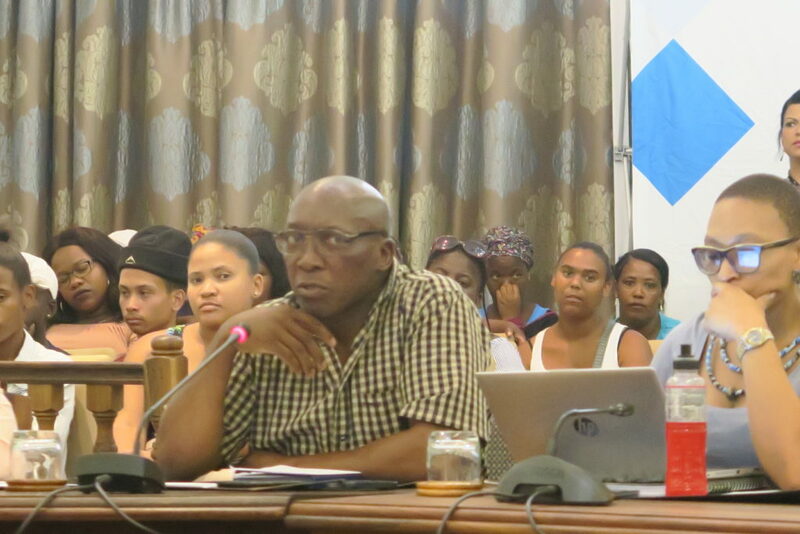 He ensured the audience that representation from all wards and areas of the greater Plettenberg Bay and Knysna were covered during the selection process. Lastly, he explained that the First Aid Level 3 course will be an entry level, where after participants will be able to further their studies to become paramedics. 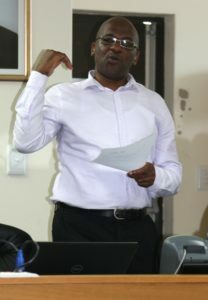 Manager in the Office of the Executive Mayor, Mr Siphiwe Dladla, gave a brief background and overview of the Programmes. 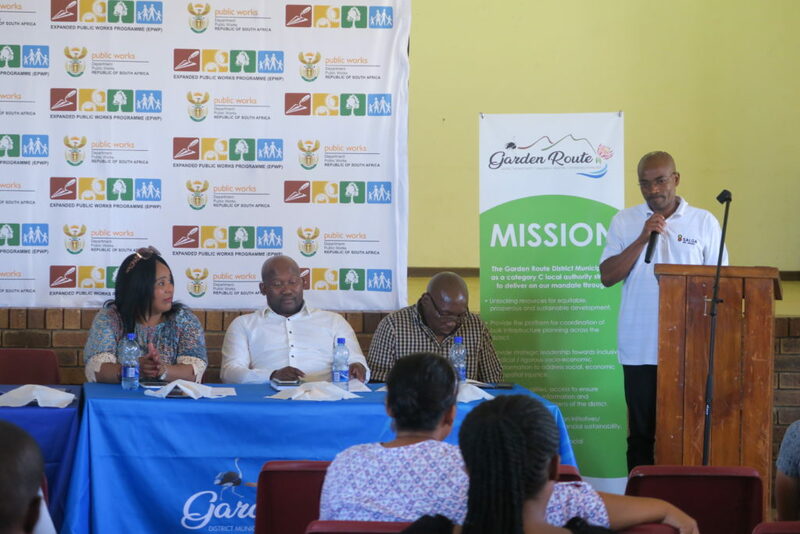 In his keynote address, the Garden Route DM Executive Mayor, Cllr Memory Booysen, stated that the Garden Route Municipal Training Programme will be rolled-out in all 7 B-municipalities in the district. He further explained that the Garden Route, in collaboration with various stakeholders, among others, the Provincial Government is in the process of establishing a Skills Mecca. He raised a concern that participants are not taking opportunities seriously and said: “People complain that they are unemployed, but when we provide opportunities to enter the employment arena, they do not take it seriously. Remember, you must be the ones who need to give the opportunities to those who did not make it into the programme, the first time around, because if this programme becomes successful, we will continue with the roll out “. 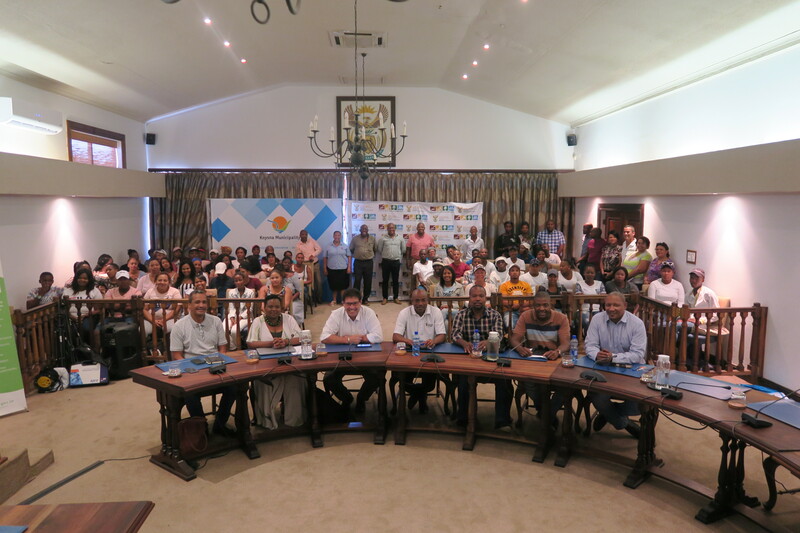 Later in the day, the second launch of the Programme took place at the Knysna Municipality. Beneficiaries from Knysna and surrounding areas attended this remarkable gathering. The Executive Mayor of Knynsna Municipality, Cllr Mark Willemse, officially welcomed guests and extended a special word of gratitude to the Garden Route DM Executive Mayor, Cllr Memory Booysen, and his delegation for an amazing initiative. The programme followed the same route as in Plettenberg Bay. In conclusion, the EPWP Manager, Mr Richard Dyantji, introduced the Service Providers appointed to train the participants. He encouraged the participants to make use of the opportunity given to them, to “grab it with both hands and run with it”. Subsequent to the formalities, service providers were given the opportunity to discuss the course layout with the participants. Mr Richard Dyantji, EPWP Manager at GRDM as well as Programme Manager of all EPWP related training programmes during his address at the launch. During the past festive season, participants of the previous law enforcement training programme acted as peace officers and assisted the two municipalities to uphold law and order. 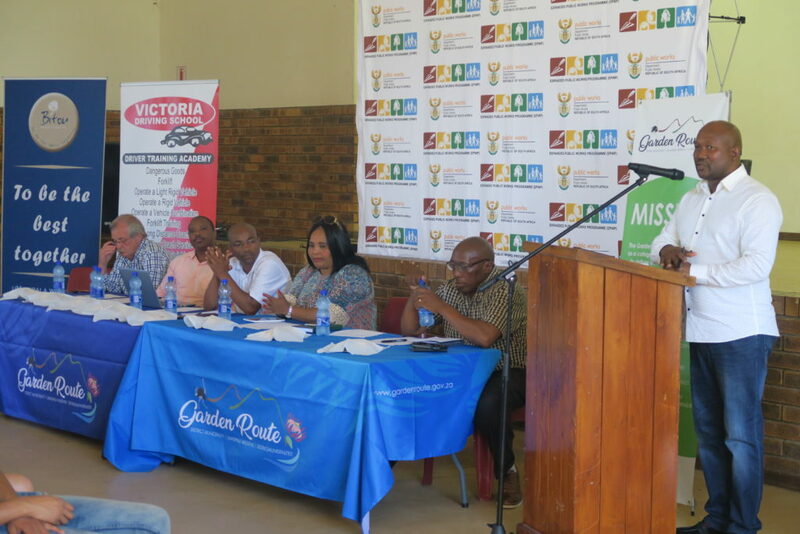 The Garden Route Municipal Training Programme will be rolled-out to other municipal areas within the Garden Route District. 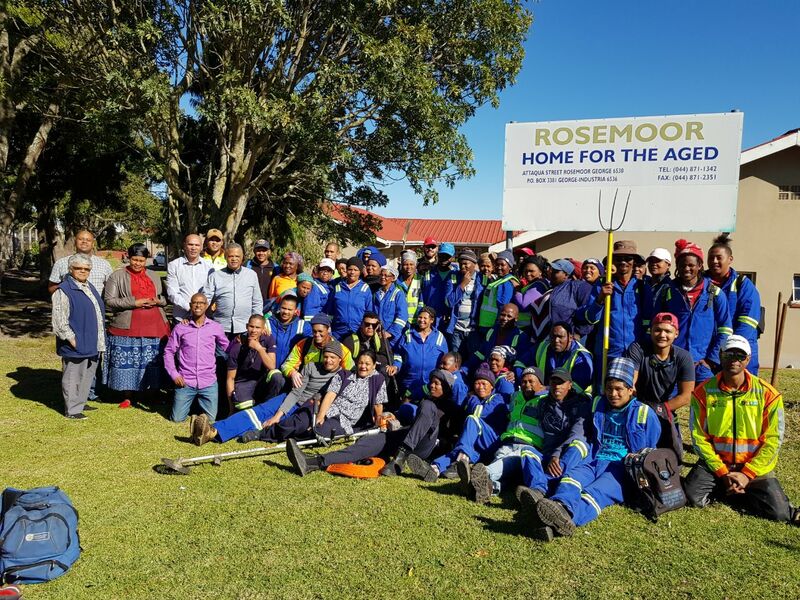 In honour of Madiba and in celebration of the “100 Nelson Mandela Centenary 2018”, approximately 50 (fifty) officials of the Eden DM Expanded Public Works Programme (EPWP) visited the Rosemoor Rotary Old Age Home, to assist caretakers with their daily activities. Some of the tasks performed were the pruning of trees, spading of the garden soil and cutting of grass. Female officials washed the walls, windows and bed linen. The team also restored the fireplace of the Centre. 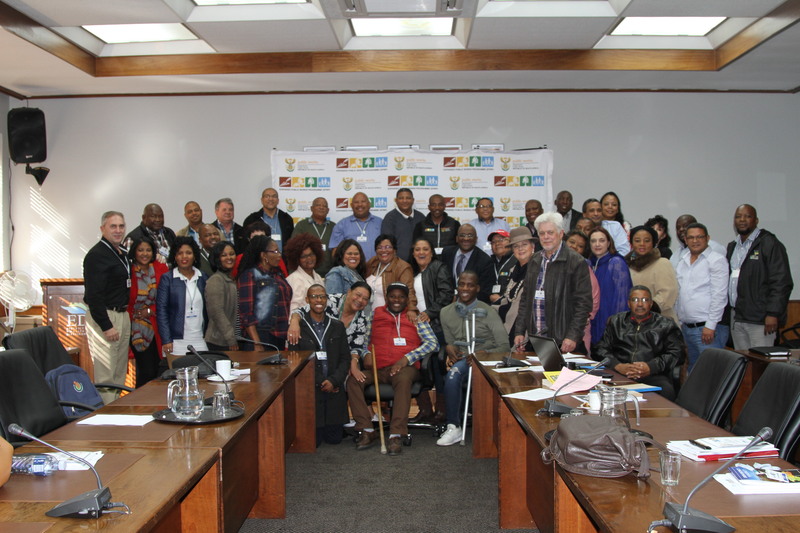 As the Political Champion for the Extended Public Works Programme (EPWP) at Eden District Municipality (Eden DM), Executive Mayor Cllr Memory Booysen recently initiated a workshop with internal and external stakeholders, aimed at providing them with a better knowledge and understanding of EPWP. A workshop, which was held on 6 June 2018, also sought to institutionalise EPWP within the organisation and therefore, this platform was used to enable Eden DM to coordinate EPWP for the entire region. 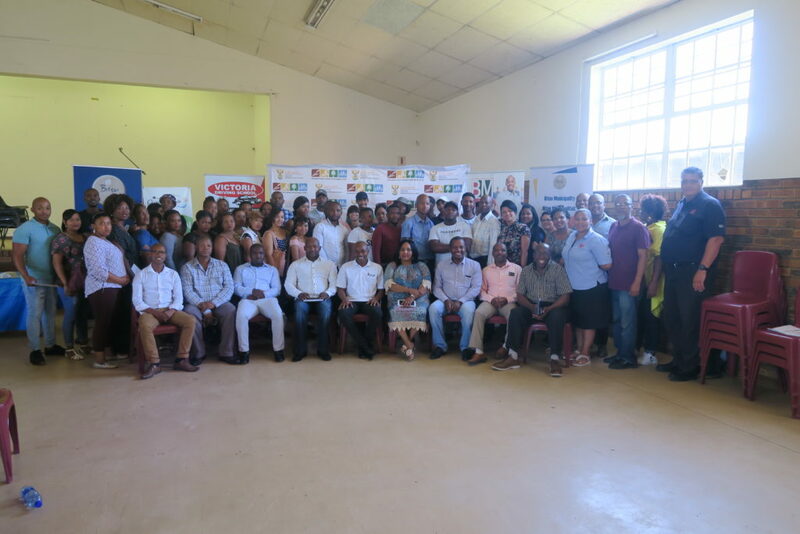 The Eden DM Council committed to an EPWP vision that strives to achieve long-term socio–economic goals, through the empowerment of youth and designated groups within the district. Council also strongly agrees that a multi- sectoral and all-inclusive approach must be utilised, to ultimately achieve the goals of the programme. Representatives of the National- and Provincial Department of Public Works with the leadership of Eden DM. FLTR (back): Mr Richard Dyantyi – Eden DM EPWP Manager, Mr John Cloete – Deputy Director Coordination, Provincial Department of Public Works, Mr Jacobus Nakoo – EPWP Technical Support: Infrastructure Sector, National Department of Public Work, Mr Tembela Ndlazi – Social Sector – Deputy Director, National Department of Public Works, Cllr Memory Booysen – Eden DM Executive Mayor, Mr Mzimkulu Gusha – National EPWP Chief Director, National Department Public Works, Mr Monde Stratu – Eden DM Municipal Manager and Mr Lusanda Menze – Executive Manager: Planning and Economic Development. Representatives from the National and Provincial Department of Public Works were invited to present on the following topics. After presentations, attendees were given the opportunity to pose questions, which in many cases prompted robust discussions amongst attendees. The representative from the National Department of Public Works enlightened Council about all the different processes, which form part of the 4th phase EPWP Plans and informed them about the consultation process scheduled for 26 June 2018. In conclusion, Mr Monde Stratu, Eden DM Municipal Manager, emphasised the fact that although the EPWP Programme is a political programme, it must not be politicised. He furthermore explained that the Programme does not belong to one department, but needs to be an organisational programme. He acknowledges the linkage between Skills Development, Training and EPWP, elaborating on the fact that Eden DM plan to develop the region into a Skills Mecca. Coordinate the EPWP or other employment programmes and be point of entry (contact) for other sectors in the region. Review the current EPWP Policy and include the structure, its dual reporting and ensure compliance to the Ministerial Determination. That the EPWP Section, through its Executive Manager re-inforce the Internal Steering Committee. EPWP must form part of the agenda of the Executive Committees of Council and Management. That Eden DM should strengthen Institutional arrangements to coordinate EPWP within the Municipality and ensure that EPWP Champions are appointed for all departments within the Municipalities. EPWP targets for Phase 3 should be included in the scorecards/performance agreements of Heads of Departments and the Municipal Manager. Regular feedback to Council, the Municipal Manager and Senior Management on EPWP progress. Continued Technical support be provided by National- and Western Cape Department of Public Works in order to assist the Municipality. That Council commit its support for more capacity within the EPWP Section. Eden DM EPWP Section must focus on sustainable livelihood in terms of training and SMME development of the beneficiaries. The Eden DM EPWP Team that was responsible to organised the Workshop. FLTR: Mr Sheldon Flemming, Mr Richard Dyantyi, Ms Henlene Festus, Cllr Memory Booysen – Eden DM Executive Mayor, Ms Beaunita van Ryn , Ms Carmen Hartnick and Mr Samkelo Mthalaliso. According to the EPWP Manager and organisers, the workshop managed to achieve the envisaged objective Council expected and they embark to have more sessions of this nature in future. 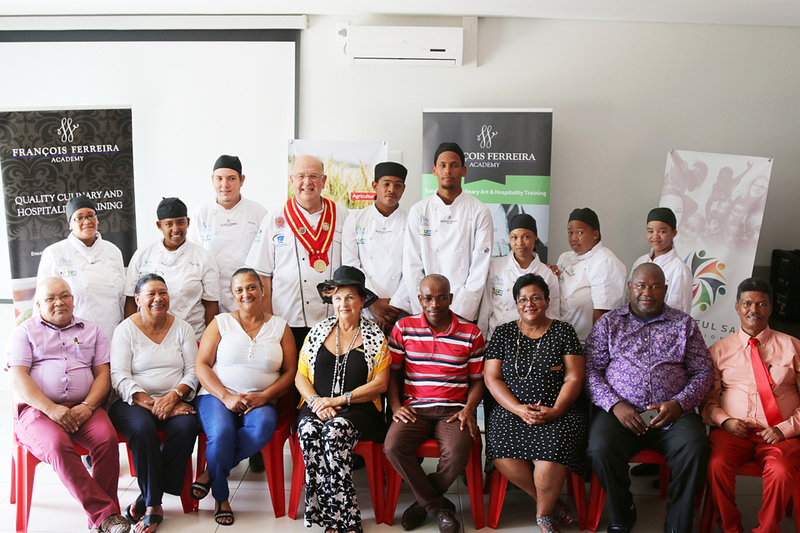 The François Ferreira Academy, in collaboration with Eden District Municipality (Eden DM), held a graduation ceremony in February for aspiring chefs of the district who completed a 3-month Cater Care Programme. Eight (8) Youth benefited from this initiative which seeks to address the skills gap and the high unemployment rate. The programme provides culinary skills training and a ‘foot in the door’ of the domestic hospitality and tourism labour markets. Councillors and students at the official handover of Cater Care Certificates. Eden DM Council committed R200 000 to the roll-out of the training which was facilitated by the Francois Ferreira Academy. The Eden DM Garden Route and Klein Karoo and EPWP Units, coordinated and mobilised the trainees through a formal recruitment and selection process. EPWP is responsible for ensuring that students get a temporary job which runs parallel to the Cater Care Training, and they provide stipends to Youth during their studies. Executive Mayor of Eden District Municipality, Cllr Memory Booysen during his keynote address to the students who completed their Cater Care course through the Francois Ferreira Academy. Interviews with applicants took place on 07 September 2017 at the Francois Ferreira Academy in George. Applicants were recruited from the Great Brak River area with the assistance of the Great Brak River Youth Café and a Non-Government Organisation – Wonderful South Africa. During an official graduation ceremony, which was held at the Great Brak River Youth Café, Cllr Cliffie Bayman, on behalf of the Executive Mayor of Mossel Bay Municipality, welcomed all those present and thanked Eden DM for their enabling role and commitment to an excellent programme. Councillors from Eden DM and Mossel Bay with the Principal Francois Ferreira. FLTR: Cllr Jerome Lambaatjeen (Eden DM Portfolio Chairperson, Financial Services), Cllr Joslyn Johnson (Eden DM Portfolio Chairperson, Property Management and Development), Cllr Erica Meyer (Eden DM Portfolio Chairperson, Strategic Services), Chef Francois Ferreira (Principal, Francois Ferreira Academy), Cllr Liza Stroebel (Eden DM Councillor), Cllr Memory Booysen (Eden DM Executive Mayor of Eden DM), Cllr Rosina Ruiters (Eden DM Deputy Executive Mayor and Portfolio Chairperson, District Economic Development and Tourism), Cllr Cliffie Bayman (Mossel Bay Councillor), and Cllr Isaya Stemela (Eden DM Portfolio Chairperson, Corporate Services). Chef François Ferreira, Principal of the Francois Ferreira Academy, in his address said: “Today you are picking the fruits of your labour, this is only the beginning. Now is the start of a gruelling task of finding permanent employment. The path forward will not always be easy, but try to stay in the straight and narrow, because it comes with many twists and turns – I am confident that you will all get there”. Eden DM Deputy Mayor Cllr Rosina Ruiters encouraged the successful students not only to seek employment but to create more jobs by starting businesses and becoming entrepreneurs. She concluded by pleading to students to register on Government’s Central Supplier Database. Eden DM Executive Mayor Cllr Memory Booysen, who delivered the keynote address, said that the occasion reminded him of a time when he was working in the hospitality industry. “You are in the right trade; I would like to see you all provide food to communities by opening or starting your own businesses. It’s not always about money, but about your passion, if you remain focused and positive you will be recognised and rewarded,” said Cllr Booysen. Ms Denise Lindley (Vice Principal and business partner, Francois Ferreira Academy) and Mr Francois Ferreira (Principal) with the Cater Care Students after they officially graduated. • Annelise Brits, Claudine Wuys, Enslin van Hagt, Ingrim van Niekerk, Rolande Cameron, Renice Roelfse, Sherilee Minnie and Waldo van Heerden. 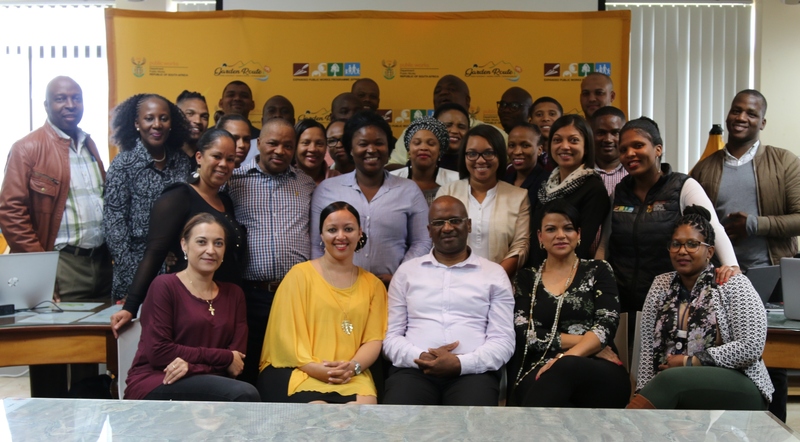 The National Department of Tourism (NDT), in collaboration with the Expanded Public Works Programme (EPWP), is currently rolling out a Hospitality Youth Training Programme in the Western Cape. Learners were inducted to the Programme on 26 October 2016, at the Eden District Municipality (Eden DM) Council Chambers in the presence of their host employers, namely Fancourt Hotel & Estate, Reheifo Lodge and Shenanigans Irish Pub and Eatery. Contracts were also handed over to learners at the induction. Practical training will be provided to the group of excited learners by Fancourt, Reheifo Lodge and Shenanigans. The purpose of the Induction was to foster greater appreciation amongst learners and to inform them about future opportunities that exist in the Hospitality Industry in South Africa and abroad. Considering that “youth development” and “building a capacitated workforce in communities,” forms part of the strategic objectives of Eden DM, the Municipality seized this opportunity and partnered with the NDT and other local role players, to serve on the project advisory committee to monitor the success of the Programme.